Life changed for Deanna Brooks the night she attended a book signing for her aunt’s best-selling paranormal romance series. There she met Burney “Burn the Cover God” Sheridan. The model for the fictional vampire hero, Burn is beyond handsome with an overabundance of Irish charm. Burn Sheridan, a man with scores of past lives, has a secret: He really is a vampire. Meeting Deanna was agony because for the first time in over two hundred years, Burn experiences the rarest of vampiric needs, the “mate of his soul” connection. Keeping people at a distance had been Burn’s existence for centuries, but Deanna makes this pledge of staying detached impossible. Burn is a vampire who has lived his lonely existence changing is name and locale about every 20-30 years. Currently, he works as a romance book cover model – ironically for a vampire series. But when the author’s niece, Deanna (aka Dean), walks into a signing, Burn recognizes immediately that she is his soul mate–the woman he is destined to make is own. However, Burn has spent so many years isolating himself from emotional attachment that he’s unsure of how to proceed. The characters are fairly straight forward – we get a bit of back story as the pair get to know one another. Both are fairly lonely, but neither has any major past trauma to keep them apart. The biggest issue is that Dean is human, and therefore a mortal. Burn internally agonizes on what must be done IF she wants to claim him as much as he wants and needs her. There were are few spots where I felt Burn was a bit stalkerish and came off somewhat psychotic, but overall, the whirlwind romance was handled just fine. The dialogue between the pair was sweet, but sometimes bordered on simple and cliche. However, honestly, it doesn’t detract from the enjoyment of the story. Overall My Vampire Cover Model is a sometimes campy, yet enjoyable look at the Paranormal Romance (PNR) genre. The light-hearted, enjoyable novella pokes a little fun at the PNR genre, book signings, and yes, cover models. There were some genre standards such as vampires that are good looking, soul mates, love at first site, and erasing memories, all of which work for this shorter-length tale. The story never tried to stand out as unique or offering something we haven’t read before, nor does it make apologies for the genre. 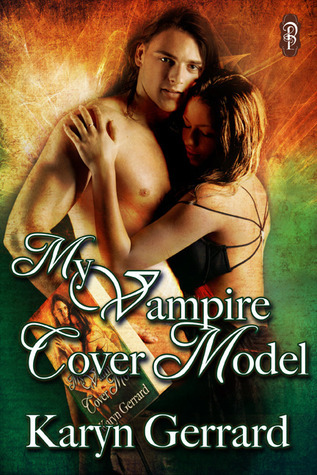 Instead, My Vampire Cover Model embraces the clichés and gives the reader an entertaining romp for a quick read.